Let’s begin our journey with a very English thing: weather talk. One thing is for sure: it doesn’t rain every day. It really doesn’t, that’s Ireland (maybe Scotland). However, England does have those stupid days when the sky is grey, the air is damp and your hands freeze off if you don’t hide them in your pocket. I had been planning to embark on the Chelsea-Battersea journey for three days but kept postponing it out of laziness and cold weather. However, yesterday I finally put my rear in gear and set off. I was at the uni (University of Roehampton) and it appeared tedious to find a tube station to get to Vauxhall (which I recommend you to do if you’re in a less suburban place than I was). 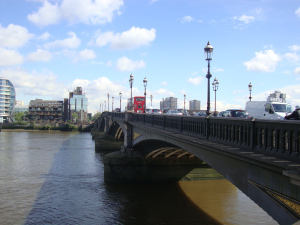 Then I had an epiphany: I took bus N170 at Roehampton, Danebury Avenue and rode it until “Albert Bridge.” I prefer buses to the tube, because they let me see so much more from the city. For example, N14 takes you past Chinatown, Piccadily Circus, Hyde Park, Victoria & Albert, the Chelsea football stadium etc. and costs only the price of a normal bus ticket instead of the 15-20 pounds sightseeing buses charge you. 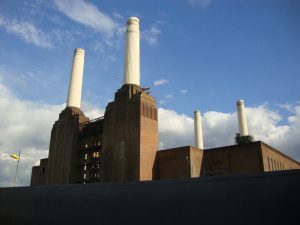 When I got off, I could see Albert bridge which looked like something made of cotton candy, the edge of Battersea Park and the looming chimneys of the Power Station. Looking right, there was Battersea Bridge and some statues. Instead of rushing to the power station, the main focus of my visit, I decided to leave it as dessert and started the exploration in the other direction. I found a cute little church, the statues of Carlyle and Thomas More and a naked lady. (They were three separate statues not a happy ménage-á-trois.) Then I arrived to the foot of Battersea Bridge which is a nice little construction with golden painting on its black body. It replaced a wooden bridge of 1771that was constructed on the site of St. Thomas More’s private landing site. The Thames is really different around here. In the pleasant sunny weather I had, I felt like I was strolling on a seaside and not an urban riverbank. 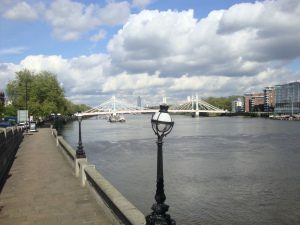 I crossed the pastel-wonder (Albert Bridge), paying serious attention to break the march, and entered Battersea Park which is a jolly place for afternoon family outings. The smell of spring merged with a memory of sweet sun cream and warm skin. If you are a dog owner, don’t hesitate to bring them along, I’m sure they would enjoy the park. There are fountains, blooming trees and a pagoda which depicts the important stages in Buddha’s life. There is also a zoo which I didn’t check out because I was planning a free-entertainment afternoon, but you shouldn’t hesitate to visit it when you are there. It was here that the first asparagus was grown in Britain. The last time a Prime Minister fought a duel was in Battersea Fields in 1829. 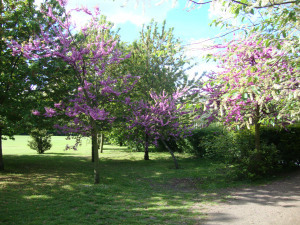 The first football match ever fought under football association took place in Battersea Park. 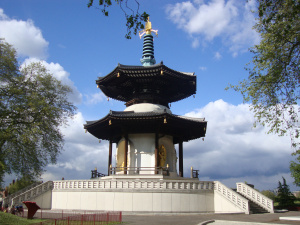 In 1985 Buddhist monks from Japan donated a peace pagoda to commemorate the 40th anniversary of the Hiroshima bomb. 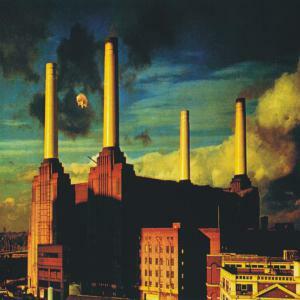 As I was walking on the riverbank, I saw the big white chimneys drawing nearer and nearer. 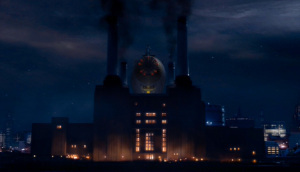 I also noticed there are advertisements of food stalls and an event around the power station. What could be more heart lifting than a warm crispy crumpet in the shadow of an old industrial building? I bravely followed the signs and arrived to a suspicious black gateway with a paper on it saying “Come in, come in, it’s free, we are having fun inside.” Well, I saw nothing but debris on the floor and a tall figure in the shadows: not the best omen and setting for a girl blessed with vivid imagination. I really wanted to see that station so I plucked my courage and asked in a very little voice if I could go in. I could, so I went. To my big dismay the food stalls were closed because there was nobody around: no crowd, no cybermen not even a flying pig. Just me and the power station and some information about its planned use. If you have ever wondered what will be the fate of this peculiar landmark, here is the answer: in the confines of a joint English-Malaysian project, it will be converted in a multipurpose housing, working, and entertainment complex. 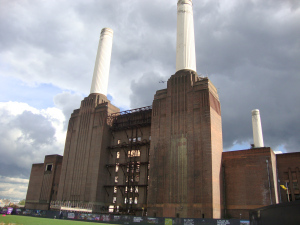 There is also a planned extension of the Northern line to provide the new power plant-dwelling population with easy transport. 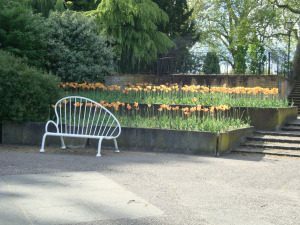 It was built between 1929 and 1939. It is the biggest brick building in Europe. It was closed in 1983. Sounds like a fun trip! 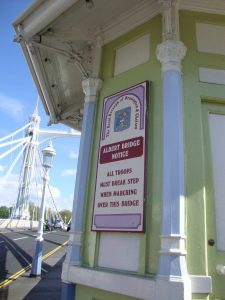 The sign on the bridge made me chuckle. XD I like bus rides for the view as well–it’s nice to see the sights when traveling instead of being underground.